Other Force Gauges | IMADA CO.,LTD. 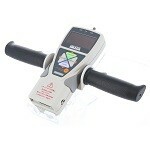 Ideal for muscle strength measurement of arms, legs, necks, etc. as well as job task analysis. This kit includes a force gauge, a handle, and pads.